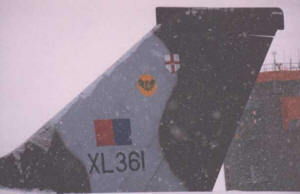 During December 1981 XL361, based at Waddington, was on its way to Offutt Air Force Base in Nebraska. En route she developed a fault necessitating landing at Goose Bay. During final approach fire warning lights displayed in the cockpit It landed safely and it taxied in to a dispersal pan, accompanied by the emergency services. After shut down it was discovered that there had indeed been a fire in the fuselage which had burnt out a few cable looms which caused a lot of the warning lights in the cockpit. She was actually quite lucky to get down safely. 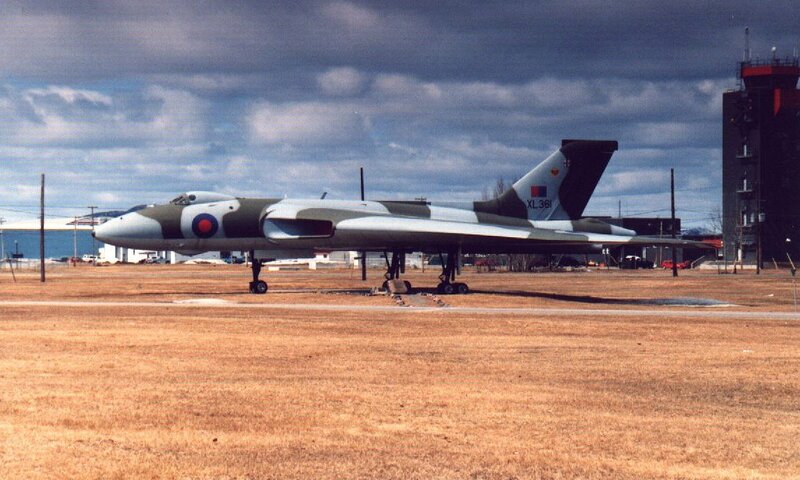 She sat in the hangar for ages waiting for a decision on her future, and with the Vulcan fleet being scrapped the obvious decision was taken to not spend time and effort trying to repair her. 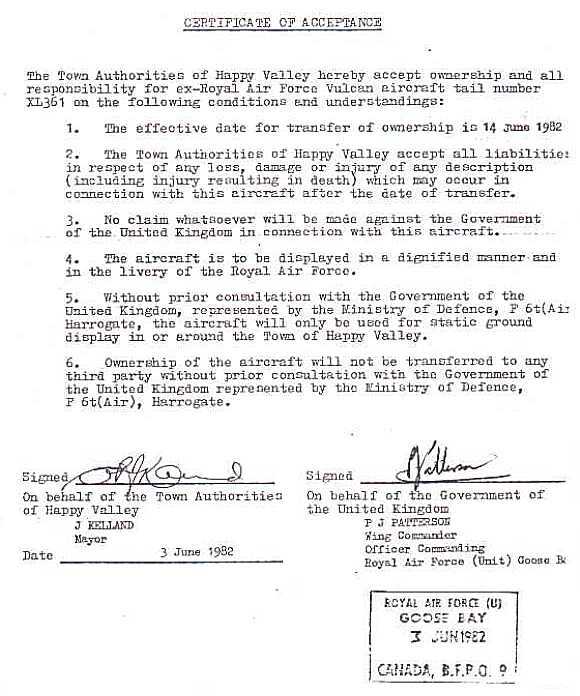 Thus the stricken aircraft was struck off charge. 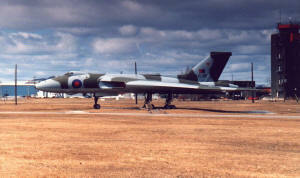 Goose Bay has long had (and still has) close links to the RAF. 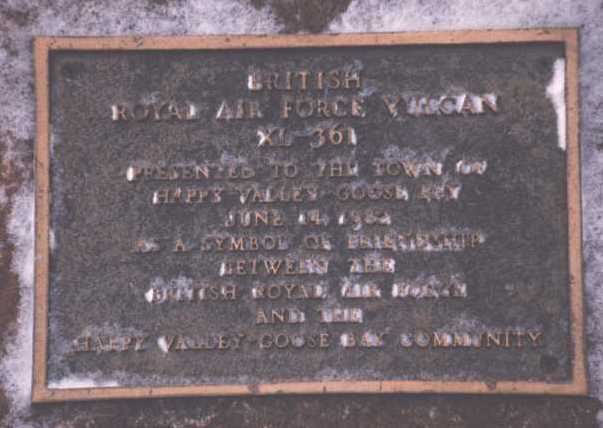 Many low level exercises are carried out from this base, and so when the Happy Valley townsfolk requested that XL361 be given to them to use as a symbol of friendship the decision was taken to present the Vulcan to the community as a gift. 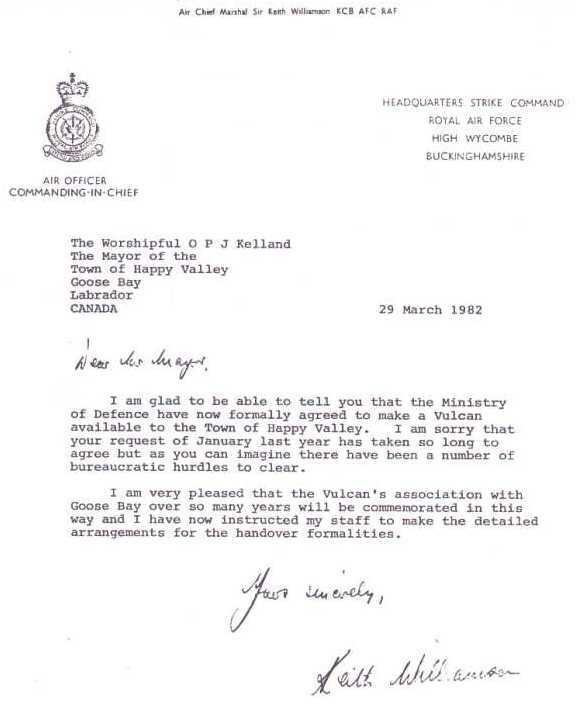 Below is a copy of the letter outlining the offer. 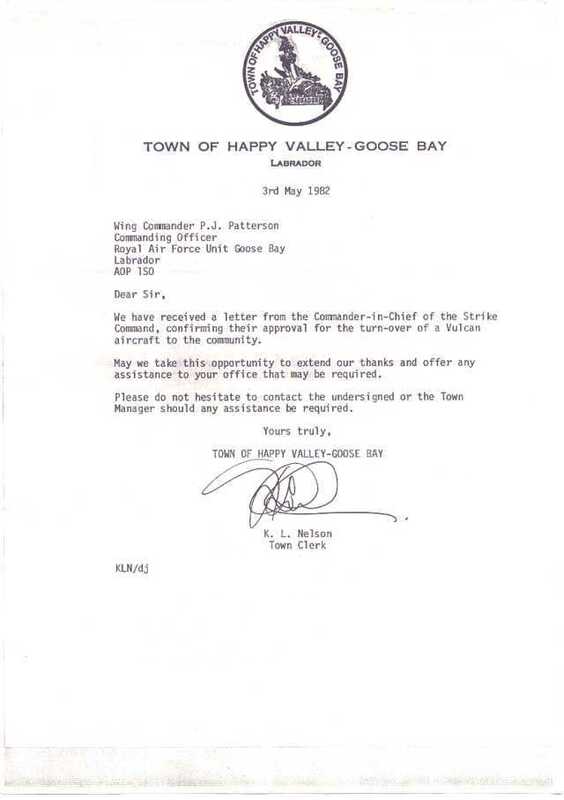 In order for the Goose Bay community to receive the Vulcan they had to sign a certificate of acceptance. Thus preventing the RAF from becoming entangled in any problems should they arise. 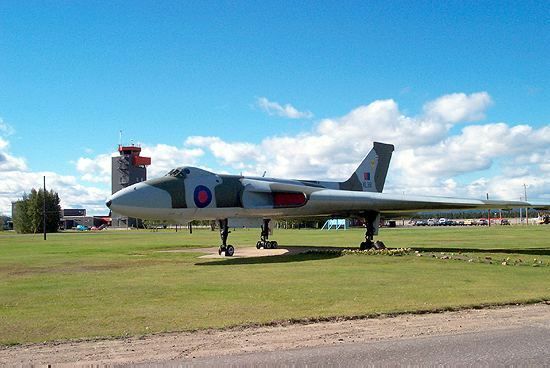 by an RAF friend of mine. 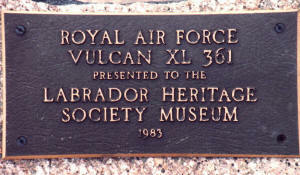 The inscription reads "Royal Air Force Vulcan XL361. 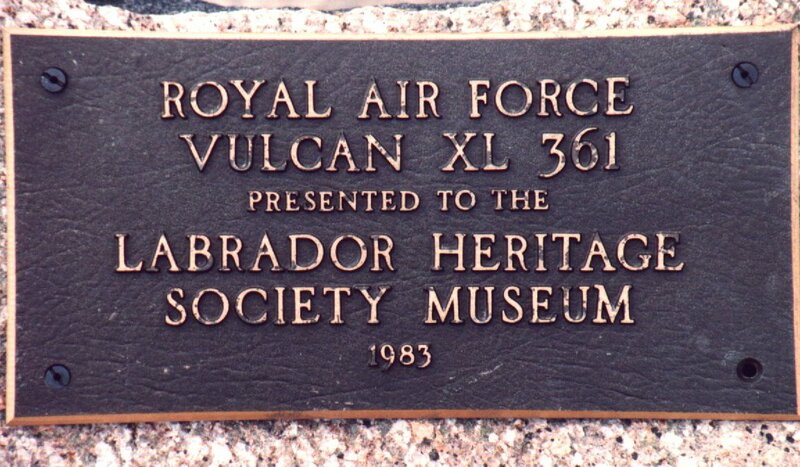 Presented to the Labrador Heritage Society Museum 1983." 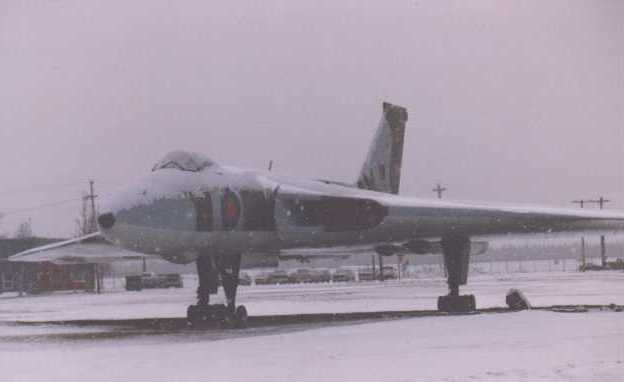 The inscription reads "British Royal Air Force Vulcan XL361 presented to the town of Happy Valley, Goose Bay June 14 1982. 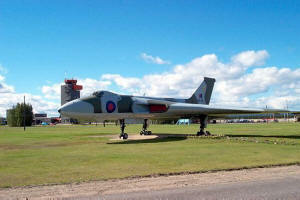 A symbol of friendship between the British Royal Air Force and the Happy Valley - Goose Bay community." XL361 resting in Happy Valley. 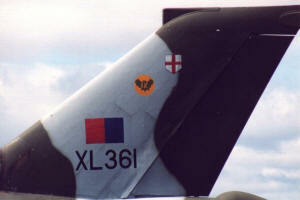 The tail fin of XL361 (note 9 squadron bat insignia). XL361 photographed during the Summer months. Note the slight bulge at the top of the tail fin. This housed the ARI 18288 passive fin-tip Radar Warning Receiver. Goose Bay during the Summer allows XL361 a well earned rest in the sunshine. Picture by "Roby" from Italy. Send e-mail to info@mongsoft.co.uk with questions or comments about this web site.